There was this little girl sitting by herself in the park. Everyone passed by her and never stopped to see why she looked so sad. Dressed in a worn pink dress, barefoot and dirty, the girl just sat and watched the people go by. She never tried to speak. She never said a word. Many people passed by her, but no one would stop. Today I was to make my own move and walk over to the little girl. For as we all know, a park full of strange people is not a place for young children to play alone. As I got closer I could see the back of the little girl’s dress was grotesquely shaped. I figured that was the reason people just passed by and made no effort to speak to her. As I got closer, the little girl lowered her eyes slightly to avoid my intent stare. As I approached her, I could see the shape of her back more clearly. She was grotesquely shaped in a humped-over form. I smiled to let her know it was OK; I was there to help, to talk. I sat down beside her and opened with a simple, “Hello.” The little girl acted shocked, and stammered a “hi,” after a long stare into my eyes. I smiled and she shyly smiled back. “Yes, you’re like a little Guardian Angel sent to watch over all those people walking by.” She nodded her head yes, and smiled. With that she opened the back of her pink dress and allowed her wings to spread, then she said “I am. I’m your Guardian Angel,” with a twinkle in her eye. I was speechless — sure I was seeing things. I got to my feet and said, “Wait, why did no one stop to help an angel?” She looked at me, smiled, and said, “You are the only one that could see me,” and then she was gone. And with that, my life was changed dramatically. So, when you think you’re all you have, remember, your angel is always watching over you. 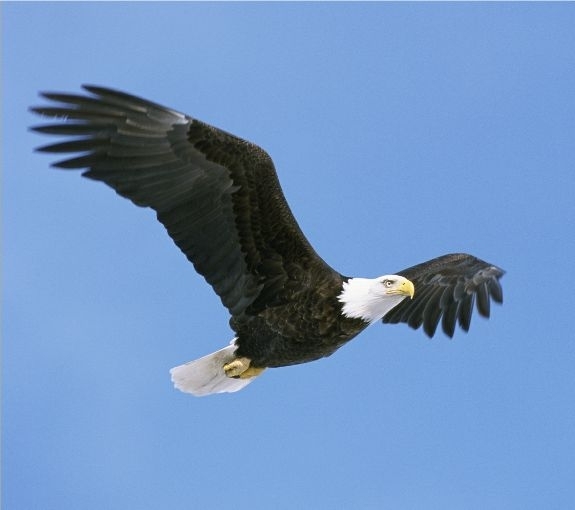 The greater the opposing wind, the higher an eagle flies. The enlarging of your capacity for rising to greater levels requires encountering a measure of resistance that demands endurance to overcome. The eagle does not avoid contrary winds; it positions itself in the face of those winds and then stretches its wings to turn adversity into and opportunity for lift and leverage. Face the wind! Stretch! Mount up! Ascend! Prepare, Posture, Position, Arise, & Fly!